Flexible Planter is a growing with a plant container. It is a great design that makes decorating with plants and flowers easier, cheaper, and fun. The tote is suitable for small outdoor or indoor plants. 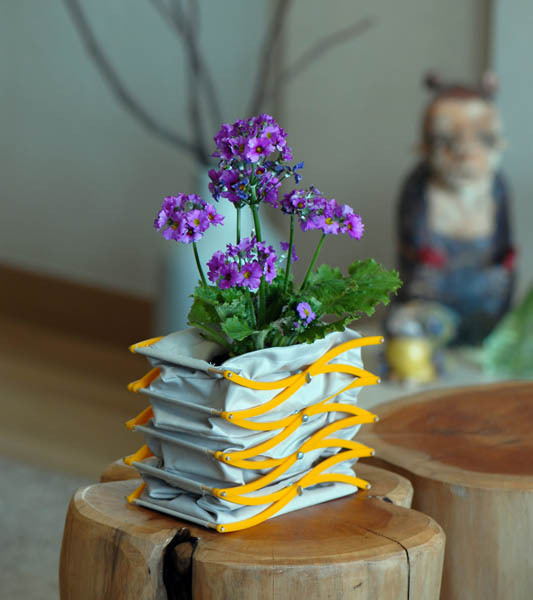 The fabric pot grows with a plant and gets twice larger. It stretches up and saves you money, time, and effort on buying bigger containers and replanting your miniature garden. Lushome presents the original and innovative Flexible Planter designed by Liu Ding. The planter features a functional and convenient design. It is a novel product of 2012 with gives an attractive look to modern interior decorating with plants. Its stretchable frame and sturdy tote fabric can make large planters. The dimensions are 12 inch (30 cm) max height x 7 inch (17.5 cm) length x 4 inch (10 cm) width. Almost weightless and very simple to use, the planter is made of a fabric bag and a metal scissors frame. A plastic layer with a heat-sealed waterproof coating prevents leakage. The frame and snap-fittings make the design deployable and fun to use. The stretchable metal structure can work as a vase, trellis or planter. It can stand on any horizontal surface creating lovely accents. 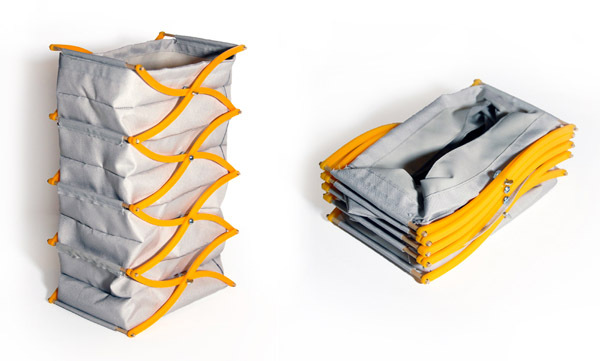 The fabrics planter is foldable for storage. It is light and portable in all different volumes. The growing planter is perfect for interior decorating and outdoor rooms, for people who are always on the move or do not have time to change pots for their growing miniature garden. The planter grows vertically connecting a few sets of the scissor frames and fabric surfaces edge to edge. The structure frame consists of molded plastic modules. You pull to deploy and press to store or make the container smaller. 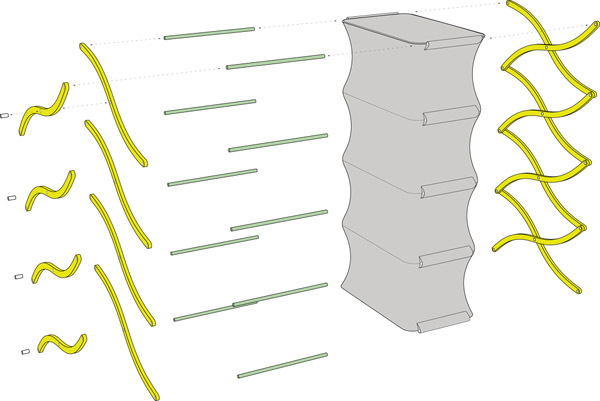 An inner plastic skin is attached to moving parts of the structure creating a tote to hold a growing plant. The inner surface features a waterproof coating. The base has a water absorbing layer to water the plant. Flexible Planter becomes larger as a plant grows. It is an excellent eco gift for Mothers Day, birthdays, and holidays. This gift idea is versatile, suitable for any age and gender. The unusual and creative planter will delight and pleasantly surprise everyone. Live plants can be placed inside this tote, wrapped, and decorated with a card or a ribbon to create a unique gift for somebody who appreciate unusual designs. Creative planters are an excellent way to represent gift plants turning them into the best presents. The stretching fabric totes help turn small plants into very extraordinary eco gifts which pleasantly surprise friends and family members. The Flexible Planter is found on Liu Ding page, liuding.com/.